Life and making a living were the principal daily concerns of the pioneers. And one means of livelihood gave its name to the community. 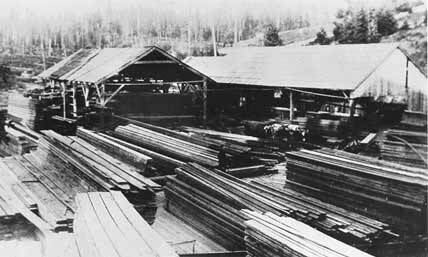 The old sawmill in Cedar Mill, established around 1855, was among the earliest lumber operations in Washington County as well as the first organized business in the area. The mill was operated until 1891, affecting the community in a variety of ways. In the beginning, the lumber business was stimulated by the needs of new settlers seeking shelter; very likely most of the lumber was distributed locally for construction purposes. Another impact of the mill was that timberland rented or bought by the operation provided profit for farmers in the area; the cleared land also proved useful for farmers. Although the mill was abandoned for lack of timber in 1892, the holding pond continued to exist as a community recreation area. For nearly 50 years after the operation ceased, local residents swam and fished in the pond. Others have enjoyed the natural beauty of Cedar Mill Creek and its falls near the site of the old logging operation. The mill became permanently identified with the community when the post office was officially designated as Cedar Mill in 1874. But even after the office was closed 30 years later, and Portland addresses were adopted, the area continued to call itself Cedar Mill. Almost certainly the presence of multiple logging operations in the community led to the name corruption "Cedar Mills." While many longtime residents continue to use the plural reference, the singular usage, Cedar Mills, is the officially designated form. Plans for a sawmill were developed in 1855 by John Halsey Jones, then 23, who worked in a Clatskanie mill near his donation land claim. Jones had been logging since he crossed the Oregon Trail in 1852, and he realized a lumber mill of his own would require a plentiful supply of trees. Leaving his claim, he traveled around the Willamette Valley searching for a suitable mill site. Seven miles west of Portland in what became Cedar Mill; Jones located a heavily timbered squatter's tract. Jones and his father purchased 183 acres from the squatter and later filed a donation land claim for the property near NW 119th Avenue and Cornell Road. Since John had previously received all the free land to which he was entitled, his parents, Justus and Lois, filed the claim. John and his eight-year-old brother, Elihu, moved to the area with their parents. A small sawmill was built by Justus and John. Their mill, as indicated on an old road survey map, stood on the south side of Cornell near a 32-foot drop of Cedar Mill Creek. According to family accounts, power for the mill was supplied by a large overshot water wheel below the falls. Above the mill site, the meandering creek was dammed in a natural basin to form a mill pond. Like other early pioneers, the Jones familiy worked together in their enterprise. John, Justus, and later young Elihu cut timber from the surrounding hills, using ox teams to skid logs to the pond for storage. to process the fir and cedar, Justus operated a siimple muley, or up-and-down saw, housed in a large sash frame. As much as 10,000 board feet of lumber could be cut each day in this manner. It was a primitive mill operation, requiring innovations for the many shortages that arose. Bacon grease served to lubricate the crude machinery and, according to one account, hand-made nails were driven into footwear and cut off at the proper length to form boot calks. When sawing was restricted by a shortage of water power, activities shifted to felling timber in the hills. A letter belonging to Jones family descendants, and provided by Halsey Jones, great-grandson of John Halsey Jones, gives an account of mill activities. "They [Justus, John and Elihu] would start up sawing logs to make a wagon load of lumber, shut down the mill and haul it to Portland about eight miles away. It took all 3 and the horses or oxen to get the lumber into town because of the bad roads. Then they would go back and cut another load and repeat it..."
In December of 1869 the mill was sold to John Quincy Adams Young and William R. Everson. The Jones family relocated in Portland and founded the Jones Lumber Company on Macadam Avenue the next year. Young built a saltbox style home next to the sawmill along Cornell Road. The family resided there for a few years until sometime prior to 1874, when the lumberman retired from the milling business. After he sold the mill to Everson, he moved his family to a larger new home across Cornell hear NW 119th Avenue. The first floor of the old family home became the location of the first Cedar Mill store and post office, where Young served as postmaster. Both homes are still standing, although the newer Stick style home has been somewhat remodeled since its construction. Eventually, growing lumber demands and the availability of more advanced machinery led to the establishment of additional milling operations in the vicinity. Two notable concerns that developed were Potter's Mill and Bonlock's Mill. Potter's Mill was founded around the turn of the century, at a time when mechanization was being adapted to the lumber industry. The sawmill, actually owned by Union Lumber Company, bur managed by stockholder E.O. Potter, was located on Hamel property near N.W. Laidlaw Road bordering Cedar Mill. After the concern was purchased from Charles Thomas in 1903, the inventive Potter set about improving the enterprise. Mechanical equipment replaced the work formerly done by oxen and horses Two 50 horsepower Russell steam engines were purchased, one for hauling logs to the mill and one for transporting lumber to the railroad. Potter used some of his timber to plank N.W. 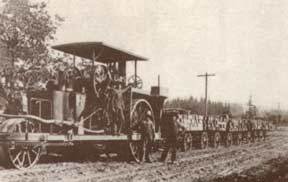 Saltzman and Thompson roads to accommodate the steam engines and the heavy wagons. When the plank roads became worn or muddy, the mill manager applied sawdust to make them more passable. Other lumber concerns eventually located in the surrounding areas where timber was readily available. One of these was Bonlock's Mill, established on Hamel property hear the southeast corner of the Saltzman-Thompson Road intersection. Within a few years, Bonlock, with a partner, relocated the mill a few blocks east of its original site. This operation contiued for several years until the timber supply was exhausted; then it was moved to various points in the Bonny Slope area where the owners pursued more convenient stands of timber. Except for a log pile under a nearby bridge, the second mill site stood vacant for a number of years. Unknown to most Cedar Mill residents, including the property owner, the log pile contained an active whiskey still where moonshine was manufactured during the Prohibition period. The logs ingeniously concealed a frame that sheltered the distillery. The operation was eventually exposed, and the whiskey runners were forced from the area when Federal agents raided the illicit enterprise.